In my last post, I showed you how I made the roses in The Rose Kaleidoscope. In this post I will show you how I made the skinny stems. First, I traced the block onto the background with a Clover Water Soluble Marker. I constructed the roses “off-block” which means I put the roses together on a sheet of freezer paper (shiny side up). For that reason, I did not trace any of the inside detail of the roses, just the outside edge. Next, I prepped all of my stem pieces and the thorns. Normally, I use a 1/4″ bias maker for my stems, but these stems are a little skinnier. Once I have prepped the pieces, I removed all of the freezer paper. This is a question I am frequently asked…Yes, I remove all freezer paper before I glue the piece onto the background. The first pieces on the background never look that exciting. But keep watching! I just realized I didn’t take any pictures of how I prepped the leaves. But there they are! Now I am ready to place the roses onto the background. I haven’t stitched the leaves or stems in place yet. I might go and do that now before I place the roses. I’ll keep you posted:) This pattern is available on my website. It is one of the blocks in “To Everything There Is A Season”. You can purchase the complete paper pattern set, or each pattern individually. I am going to be stitching each block again and I’ll keep you updated on my progress. I have been merrily stitching away (on my machine!). I started out just making a few of these Monkey Wrench blocks and I got a little addicted! Now I am putting my sections together. I made 81 blocks, so I made 9 sections of 9 blocks. I tried very hard to arrange the fabrics so that like fabrics didn’t end up together. I numbered each piece so I wouldn’t get confused…that is an important step! I prefer to put quilts like this together in sections, rather than rows. It just seems like less work! I have yet to figure out a border for this quilt and I must confess, it is keeping me up at night. I am thinking swags (as usual)! Speaking of hexies, I am still hand-quilting my hexie quilt. The cooler nights lend themselves to being wrapped up in a quilt. Speaking of weather, my thoughts and prayers go out to everyone who is experiencing extreme weather conditions. Paper Pattern for “To Everything There Is A Season” now available! As promised, the paper patterns for “To Everything There Is A Season” are back on the website! I tweaked the patterns a little, and now every pattern piece is labelled for easy colour selection. The pattern is available on my website. Here I am (proud as punch) after my quilt received an award of Excellence in Applique at Quilt Canada in June. You can order the complete set, but each pattern is also available as an individual pattern. This is not a difficult quilt to make (I wouldn’t lie to you!). If I could give you one tip, this would be it…when you prep your pieces, lay the freezer paper template on top of the prepped piece (shiny side up) and trace the remaining seam allowances. Here is a blog post showing this technique. You will thank yourself when it is time to put the pieces altogether because they will actually fit! Also, I found these roses easier to construct “off block”. I use a piece of freezer paper (shiny side up) which I have taped onto the pattern. Then I build the roses on top of the freezer paper. Ta Da! Both easy and stress-free! When I chose my fabrics for this quilt, I went with the thought that “More is Better”. That is, when the pattern called for light pink, I used many light pinks, not just one. As long as there was contrast between the fabrics, I was good with that. Also, I used many, many different shades of green. Feel free to switch up the colours (like I did on the Hummingbird block). The flowers are “supposed” to be pink, but I had a piece of purple fabric in my stash that was calling my name. Remember, it is your quilt and do what makes you happy. Speaking of fabric stashes, I started a quilt in the hopes of using some of my scraps. Some of these scraps are 10 years. Time to let go! I stitched a couple of blocks, just for the fun of it. I liked what I saw and so I continued cutting and sewing. Notice there is no applique…yet! 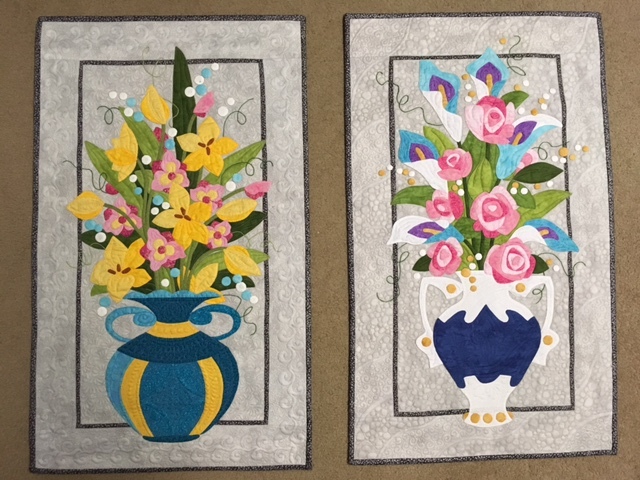 Have you had a chance to look at the Catalogue of Classes for The Academy of Applique? Registration opens Labour Day Weekend. The majority of classes fill on that weekend. These are the class samples that I will be teaching. I can’t say enough about The Academy. The food. The venue. The classes. The best part is being surrounded by people that “get” your passion for hand-applique, because they have the same passion. It is so inspiring to see what everyone is stitching. I hope to see you there! Wait til you see this!! When I (finally) finished the applique on “To Everything There Is A Season”, I handed it over to Rose from Fancy Feathers with my usual set of instruction. My instructions were: “Do whatever you want. Surprise me.” I am that kind of quilter! So when Rose called Thursday to say the quilt was ready, I could not wait more than a day before I went to get it. To say Rose did a spectacular job is putting it mildly…extremely mildly!! I love everything about the way Rose quilted it. I especially love how the feather borders inside each block do not go all the way around the block, and have a random feel to them. Love it!! This pattern was designed by Marilyn at MT Designs. Marilyn has not seen the finished quilt yet, but she will see it tomorrow at Thanksgiving dinner! The individual patterns for each of the blocks are available on my website Simple Bird Studio as paper patterns for digital patterns. The centre medallion will take your breath away. I wish you could see this quilt in person! The last piece has been prepped and now the last stitch has been taken! I am so thrilled to say I am finished this quilt. I won’t be shy….I think this is a beautiful quilt. It was designed by Marilyn at MTDesigns, an amazing artist who can take my fuzzy, vague ideas and put them into amazing drawings, which I can then applique. Thanks, Marilyn!! So, here is the Winter Border. The patterns for the blocks and the Centre Wreath are available on my new website. The borders are not on the website yet, but they soon will be! The patterns for each block are sold individually, so if you do not want to make the entire quilt, you can make a wallhanging (or two!) or some pillows. The choice is yours!